Ischemia arises when both blood flow and oxygen transport to a tissue stop, while hypoxia describes a condition where normal blood flow continues but there is a reduction in the supply of oxygen to the tissue. For both hypoxia and ischemia, depriving the tissue of oxygen causes cells to switch from aerobic to anaerobic respiration. This results in reduced ATP synthesis, which in turn decreases the effectiveness of the cell membrane ion pumps, especially the Na-K-ATPase pump. Additionally, in the case of ischemia, reduced blood flow has the effect of reducing the tissue's supply of metabolic substrates, and it also reduces the efficiency of waste product removal. Ischemia and hypoxia have been experimentally studied in a wide variety of species and different tissue types. Tissue responses to ischemia include swelling of the intracellular space, shrinkage of the extracellular space, and an increase in the extracellular potassium concentration ([K+]e). In neural tissue, this increase in extracellular potassium concentration occurs in two stages; an initial rapid increase from about 5 mM to 55 mM, followed by a slower increase up to 80 mM. In cardiac myocytes, there are generally three phases observed: a rapid increase, a relative plateau, and a second, slower increase. These increases in extracellular potassium concentration may have important pathological consequences. For example, in cardiac ischemia, the increased [K+]e may cause arrhythmias. In 2003, Chung-Seon Yi, Aaron L. Fogelson, James P. Keener, and Charles S. Peskin studied the possible mechanisms underlying extracellular potassium accumulation during ischemia. They developed a simple Hodgkin-Huxley type ionic model, which unlike other previously published models of cardiac myocytes, includes extracellular volume, capillary flow and the influence of nearby healthy tissue as variables (see figure 1 and figure 2 below). The model describes events in a tissue consisting of a collection of homogeneous cells subject to ischemia or hypoxia, a homogeneous extracellular space surrounding three cells, a capillary compartment representing the vasculature for this piece of tissue, and another compartment corresponding to the healthy tissue surrounding the ischemic or hypoxic tissue. The first three compartments combine to form the damaged tissue. Model simulations produce a response to ischemia similar to that seen in neural tissue, and the mechanisms underlying this process in the model is elucidated. However, Yi et al. found that the same underlying mechanism is not present in the cardiac ion model, and they suggest that this difference may explain the qualitative difference in response observed in cardiac tissue. A schematic diagram of the Yi et al. 2003 mathematical model. In the tissue damaged by ischemia or hypoxia there are three compartments: an intracellular space within a collection of homogeneous cells; the extracellular space surrounding these cells; and the capillary space serving the cells. In addition there is a fourth compartment which represents the extracellular space of the undamaged tissue. 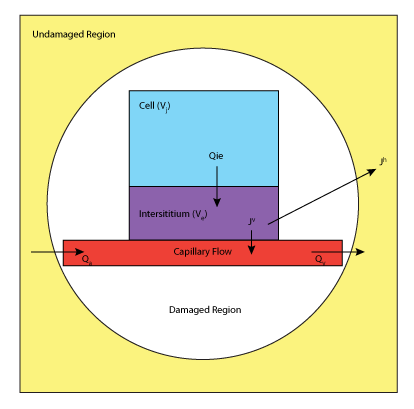 The cell membrane separates the intracellular and extracellular compartments, and the capillary wall separates the extracellular space from the capillary space. A schematic diagram describing the ionic components of the Yi et al. 2003 mathematical model. 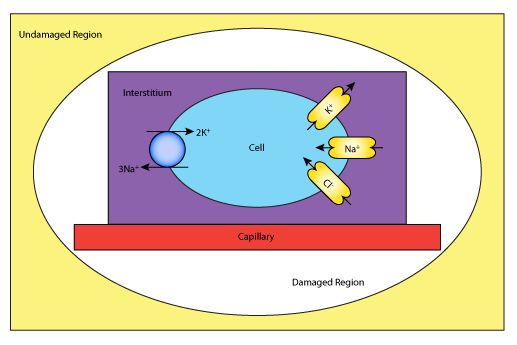 Sodium, chloride and potassium ions are exchanged between the intracellular and extracellular environments through channels and via the sodium-potassium pump. Water is also passed between the various components. Derived from workspace Yi, Fogelson, Keener, Peskin, 2003 at changeset 022023598e97.